At 11 a.m. EDT, Commander Randy Bresnik of NASA spoke with U.S. Ambassador Marie Yovanovitch live on NASA TV, and she moderated questions from Ukrainian and U.S. Embassy students eager to hear more on what it takes to be an astronaut aboard the orbiting laboratory. Bresnik spoke of his extensive training regimen before embarking on his mission, but reiterated that working together cohesively with a team and getting along with others ranked at the top of needed skills for an explorer. 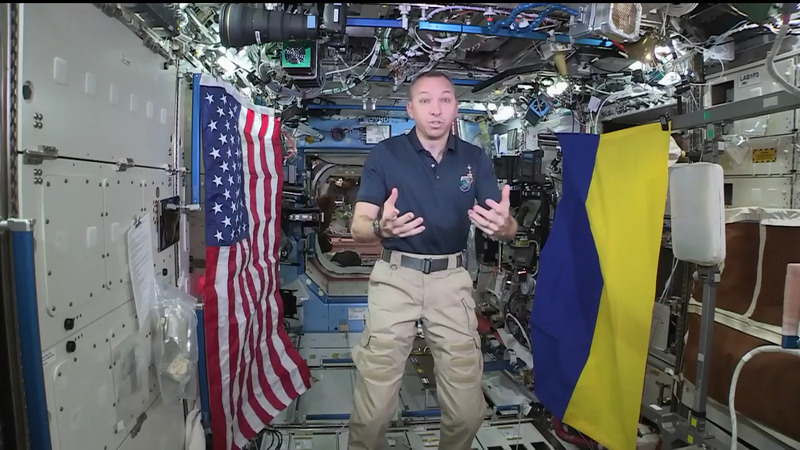 Bresnik also touted fellow crewmate Flight Engineer Joe Acaba of NASA’s upcoming project on Friday: harvesting lettuce (five kinds, no less) that has been growing in space. He reminded the students that seeds may be a key component to deep space missions due to their small space requirements, making them perfect for packing into a compact spacecraft. Growing food is also the most sustainable option for crews hoping to live on the Red Planet for an extended period of time. Before closing out the event, Bresnik told the students to always nurture their thirst for knowledge, as it’s a trait that can be found among all astronauts and cosmonauts. ESA (European Space Agency) astronaut Paolo Nespoli took part in Day 2 of the 11-day study for Astronaut’s Energy Requirements for Long-Term Space Flight (Energy), an investigation zeroing in on the side effects of space travel. Today, he collected water samples from the station, continued with urine collection and stowed the deployed Pulmonary Function System equipment. The crew, as a whole, logged their food and drink consumption, furthering beefing up critical data for investigators. Physicians will examine metabolic rates, urine content and bone density to determine energy requirements for even longer missions in deep space. Since astronauts often lose body mass during extended stays for reasons that remain unclear, specifics about the crew’s metabolism and activities, as well as other conditions, help ensure they are properly nourished for their demanding schedules in zero-g.
A small amount of Freon (about 100 milliliters) leaked out from a small nanosatellite poised to be launched from Kibo on Friday. There is no risk to crew health and safety and no risk to station hardware. Teams remain on track to deploy this nanosatellite Friday. Hi it’s me again Drake. Going to the Mars sounds very cool if you discover that people can live on Mars please send us to Mars to live there.